drinkboston.com » Blog Archive » Punched! If Monday night’s Flowing Bowl Punch Party, hosted by drinkboston at Eastern Standard, were a high-diving competition, it would score a perfect 10 for both execution and technical difficulty. I mean, how often do you walk into a bar and see 60-odd people holding decorative cups filled with punch made from 200-year-old recipes? 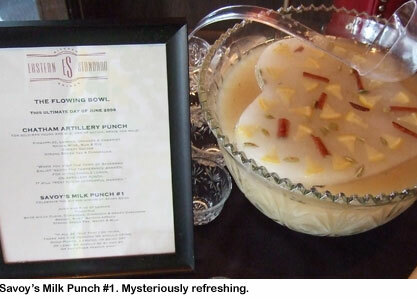 How often are you served a drink that involves steeping three kinds of booze, multiple fruits and spices and green tea in hot water for several hours, adding milk, straining the curdled mixture through cheesecloth twice and chilling the finished product down with a massive ring of ice decorated with pineapple slices? 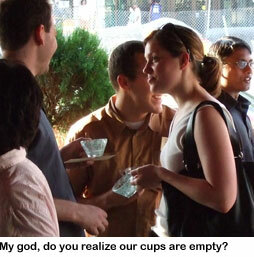 And how often do you see bartenders ladling liquid out of large, flowing bowls instead of shaking cocktails? 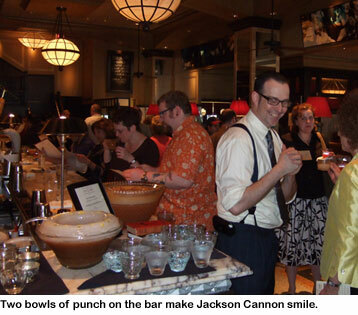 Thanks to Jackson Cannon and Tom Schlesinger-Guidelli for concocting the four punches — all deceptively potent and enjoyably distinct from one another — from recipes in David Wondrich’s Imbibe!, the Savoy Cocktail Book and Martha Washington’s own notebook. And thanks to the rest of Eastern Standard’s staff for the charcuterie, deviled eggs, beef carpaccio and other tasty bites, and the gracious service. 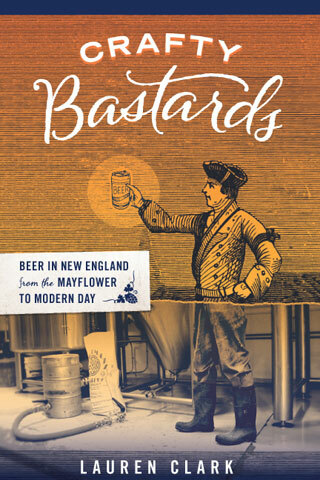 Below is a list of the punches that were served, along with their key ingredients and bits of historical poetry revealing that odes to alcoholic beverages in America existed well before the Algonquin Round Table. To create these punches yourself, either consult the aforementioned sources or click on the links below. Toast of Schuylkill and to Independence! Created by a colonial rod and gun club on the banks of Pennsylvania’s Schuykill River and remembered in modern times thanks to a recipe passed on by a Philadelphia lawyer, Charles Godfrey Leland. Cheers to our first First Lady! This recipe is said to have come from Martha Washington’s own journal. For soldiers young and old, men of action, brave and bold! The house punch of the Chatham Artillery of Savannah, Georgia, formed in 1786. Recipe available in Imbibe! Celebrate the wit and wisdom of Aphra Behn. Aphra Behn was a 17th-century English dramatist and novelist and the “first woman ever to earn her living solely by writing,” according to Imbibe! She is also credited with inventing milk punch, a drink that is “undeniably smooth, but not necessarily lush,” writes Wondrich. This recipe is the Milk Punch #1 from the Savoy Cocktail Book. So nice to meet you! We’re definitely having at least one of these for the 4th this weekend. Quaffable, yet dangerously strong. Yum. Same to you, Tina. What says Independence Day more than old-fashioned American punch? I’m totally not jealous that I live 3000 miles away from Boston. Nope. Not a bit. Oooooh, punch party on the West Coast! Thanks for the event and it was great meeting you! The punches were definitely high impact – in the best possible way. Adam — yeah, I mean, these punches take some effort to make, but once they’re in the bowl sitting on ice, all you have to do is ladle them out to your friends and bask in their awe. Das — I know what you mean, brother. Sorry I missed this event, it sounded great! That 5:30pm start time was too early for me (to leave work, not to sample punch). So my wife’s not only spending enough time on drinkboston to get first post, she’s spending enough time to actually pick me out in the photos. First photo, to the left of Jackson’s neck is a lamp, then Ian’s head (Hi, Ian, at least I think that’s you), then the red blur that is the brim of my sox cap. Anyhow, I just got done making the stock for the Chatham Artillery punch. (Thanks, Tom! if you’re working at all this weekend and want to offer me a critique, I could drop a glass by). It still needs to mature and get the last kick of bubbly, but it tastes like promise thus far. Lauren.. look at what you (and the bartenders you mention on it) have brought us to. 2 years ago, We were still drinking flavored vodka and diet soda. Now, we start at Eastern Standard at 5:30, get to Green St. at 8:30 then back to ES to close the place down. On a Monday. MC — Dang, sorry about that. The start times are always perfect for some and unworkable for others. Hope to see you next time. Drew — I love stories like yours! 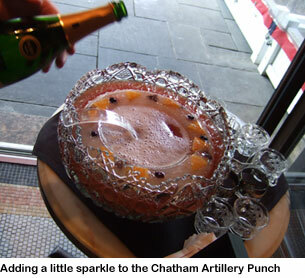 From flavored vodka and diet soda to Chatham Artillery Punch in two short years? Yay. Quite a Monday outing you had there. I regret that we didn’t make it up for this. Maybe next time. Nevertheless, see you in NOLA!